Drawing a Sperm Whale skull on the West side of Berneray, Outer Hebrides. Did I mention that I am an artist? As well as tending sheep and running The Birlinn Yarn Company, I also make art. Living in this harsh yet beautiful island environment, I am never short of creative stimulation. To dwell in such a place, where the forces and cycles of nature are extreme, is both inspiring and humbling. Nature here is dictator, rhythm setter and provider despite our technological advancements. At 57* North and exposed to the Atlantic, of all the elemental forces, the wind defines life in the Hebrides. For some time now, I have been creating wind drawings by setting up contraptions that draw according to the direction and strength of the wind. The results are a bit like scientific scatter plots showing the tendency of wind strength and direction on a given day. Living on an island and as a sea faring family, the shipping forecast is very important to our daily lives. Thus each drawing is named after the shipping forecast on the day on which it was made. Wind Drawing - Shipping Forecast - 12 February 2017 - Rockall, Malin, Hebrides, East Bailey. Southeast backing easterly force 5-6, increasing force 7. Moderate. Occasional rain then showers. Good. Another elemental quality that defines our lives here is light … or dark. In the summer, we have almost 24 hours of day light which is fun but also exhausting as you just don’t quite know when to stop work. In the winter, darkness can fall as early as 4 p.m. with the kids going and coming home from the school in the dark. Without work, projects and exercise it can be a long dark struggle until spring arrives. So, recently I have been developing a new line of art work exploring the elemental qualities of light and dark through alternative photography. 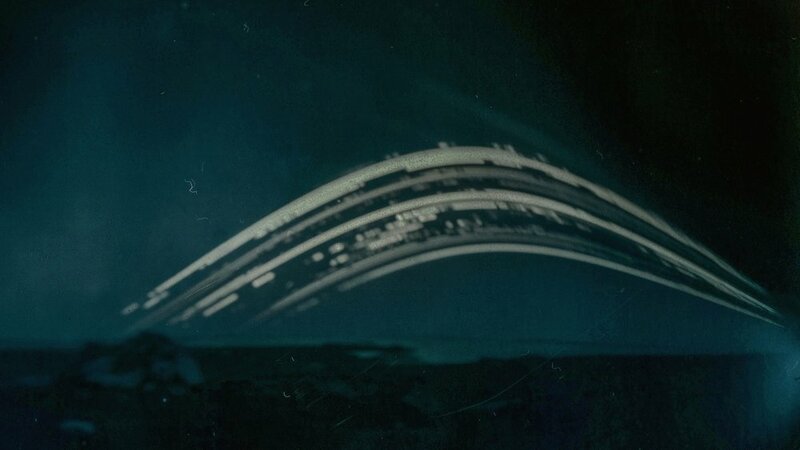 I set up solargraphs, which are pin hole cameras placed outside in-situ for 2-3 months. When angled towards the sun they slowly track the apparent arc of the sun as it rises higher or lower each day depending on the time of year. Solargraph in-situ at Neolithic kerbed cairn, Berneray - January - March 2017. These grainy images are embedded with time. They make us look and consider an aspect of our lives that our ancestors carefully watched but that we no longer see. Hence, my solargraphs are set up near archaeological sites within the North Uist moors that have alignment according to the sun. This often involves long boggy walks into Langass moor, into a landscape that is stark and bleak but stunning. Often golden eagles drift, hunting overhead or a herd of red deer stand and stare before taking flight. It is a place I love to sit a draw in the wild, peace and quiet. Neolithic Long Chambered Tomb, Langass Moor, North Uist. Recently I have been considering the need to bring together the two lines of my creativity The Birlinn Yarn Company and Meg Rodger … the artist. The Hebridean sheep we breed on our croft are part of a family of sheep referred to as North Atlantic Native Sheep and were brought to the Hebrides by the Vikings in the 9th Century. On their rampaging voyages the Vikings also dropped off sheep in Iceland, Greenland, Faroes, Shetland, Orkney and St. Kilda. The relevance of this was brought home to me when I recently spoke at the NANS: Wool 2018 conference organised by Uist Wool in September. Sheep breeders travelled from across the Northern periphery for discussions on our shared passion for our hardy little Northern sheep. These sheep come in a range of colours from dark brown to rusty, mottled to pure white but all share the same thrifty, intelligent and horned characteristics. It was truly great to be in the company of so many experienced sheep breeders, wool producers and yarn enthusiasts. We were very grateful to Uist Wool for co-ordinating everything and looking after us all so well. Motivated by this experience, I decided that it was time to explore the origins of my little black sheep through my creative practice and hence applied for an artist residency in Iceland. Thanks to support from the Visual Arts and Craft Makers Fund (Comhairle nan Eilean Siar & Creative Scotland) I will now be spend 3 weeks during February at Textílsetur Ísland - the Icelandic Textiles Centre in Blönduós, Northern Iceland. Our Hebridean ewes on Berneray machair with snow on the hills in Harris. My plan is to meet other shepherds to learn more about how they manage their flock in the depths of Icelandic winter, which will be even darker and colder than the Hebrides. I hope to make a short documentary combining and comparing our croft life tending our black flock, with their Icelandic experience tending their white and multi-coloured flock. My interest in darkness and light will also play a part through alternative photography and landscape drawing. It will be a wonderful opportunity to also spend time researching Icelandic wool traditions - the sweater patterns, felting and use of sheepskins. There may be creative ways of combining their wool culture with those I bring from the Hebrides. Exploring the history of the Vikings and their sea voyages and sagas will contribute to how this all starts to evolve. So there you are, I have my mid winter project to take me through the dark months until Spring comes and the light returns once more. If you have any Iceland sheep, wool or knitting contacts or ideas of where to visit I would love to hear from you! !